Princess She Not edges Score’s Even in the feature A and lower event in a close finish. racehorse of the Shariff Racing Stables, whose owners may definitely be thinking of changing her name. 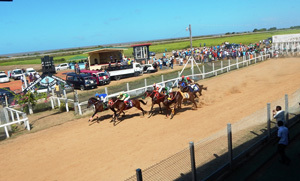 That is after the animal’s stunning upset victory over a star studded field led by Guyana number one racehorse, Score’s Even in the feature A and lower event at the Kennard Memorial Turf Club/ PPPC one day meeting held last Sunday at the club’s track, Bush Lot Farm, Corentyne, Berbice. As the day unfolded it was Princess She’s Not, recently imported a few months ago from Kentucky USA and classified D3 that took the cake. Ridden by Trinidadian Jockey Keran Razack and carrying a weight of 108 pounds, the horse showed tremendous speed. 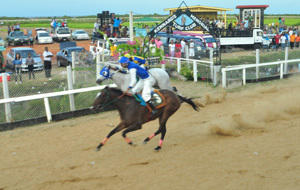 This was its third race since coming to Guyana, having scored a second and third place before. The five animals in the race were off to a level break with Princes She Not, Score’s Even and California Strike going out early. However Razack on the speedy Princess She Not showed its intentions as he sent the animal at full throttle early. By the time the horses were on the back stretch all guns were blazing as New Queen was leading them on a merry gallop. The others were playing catch up with Score’s Even moving into position. But as the race got deeper the leader was showing no let up and an upset was in the making. Score’s Even with Rad Drepaul decided to give it it’s all as the racehorse hit the homestretch and began to make up grounds, but with the lightning speed of the light weight Princess She Not along with the hot and dusty track coupled with the high wind, it was too much too late for Score’s Even as Princess She Not kept its nose in front for the gate to pole win in the 1600M event. The Shariff connections were a happy bunch as they rode off with the $1.2M and the President’s Cup from Score’s Even, Grande De Roja and California Strike. However, if the upset victory was not enough to send tongues wagging, now controversy has erupted as some of handlers are claiming that the event was not fairly contested. They are claiming that Trinidadian jockey Keran Razack was allegedly spurring the horse with an electric shock, with which he was riding. The matter is to be investigated. However owner of Princes She Not, Mohammed ‘Nankoo’ Shariff has denying such allegations, and welcomes a proper and thorough investigation. Silent Night racing to victory in the G 3 race. The Jumbo Jet connections with Colin Ross aboard Appealing Harvest rode away with the D3 Non Winners event as Right to Rule Swing Easy and Princess Alicia were put to their places in the 1400M event. It was a one two win for the connection of the Jumbo Jet stable as Release the Beast was released with much ferocity to take the G1 and lower 1200M event from stable mate Settling Jet with Damascus Dream and Battle Hymn rounded out the money. Silent Night of the Shariff racing stable brought things back to on track in the G3 and lower event with victory in the 1400M event ahead of Super Bowl, Marathon Man and Top of the Line. Gold Dekova ridden by Razack led Settling Star for a one two victory for the Shariff Stable in the Two Year old West Indies bred 1000M event ahead of That Son of a Gun. Slim Shady of the Mootoo stable with Ajai in the saddles was too good for Devil Woman, Amazon Warrior and Secret Escape in the 1000M event for Two year old Guyana Bred horses. It was by no means an easy task for Easy To Win of the Dookie stable with Randolph Richmond in the I and lower 1400M gallop as it edged out Savion and Mary Ann and the Road Is Mine. Famous Pride of the Washington stable ridden by Russell Chichester scored a famous victory in the J1 and lower race ahead of Little, Swift Way and Royal Cash. Red Jet owned and ridden by Shamsundar then blazed away to victory in the J3 and lower 1000M race ahead of Dance for Gold, Swift Away and Speed Vision. Regina of the Cheffoon stable was in winner’s row in the K and lower 1000M race ahead of Iron Man, Fit To Fight and Magdalene. The Shariff stable for the second consecutive time showed that they are large and in charged as the copped the champion stable award. Trinidadian Jockey Keran Razack, who was flown in by the principals of the Shariff stable, showed that their investment was worthwhile as he rode away with the champion jockey award. Glendon Sooklall and Zaheer Shariff were the champion trainers. They received trophies compliments of The Trophy Stall and the organizers. Over 80 horses participated in the day’s activity which had close to $8M in cash trophies and other incentives up for grabs.